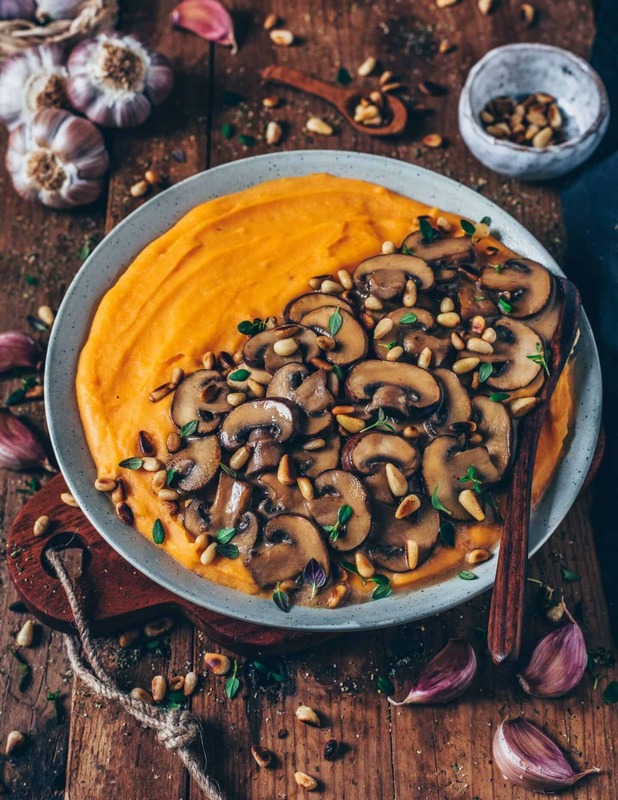 This creamy Mashed Sweet Potatoes with vegan Mushroom Gravy is very easy to make, healthy, plant-based and so delicious! 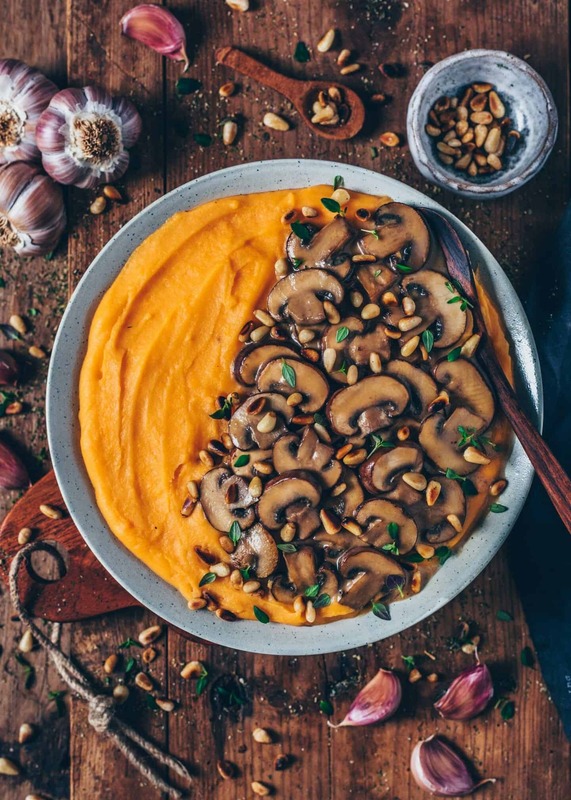 It’s a simple recipe that is comforting, flavorful, hearty and satisfying. 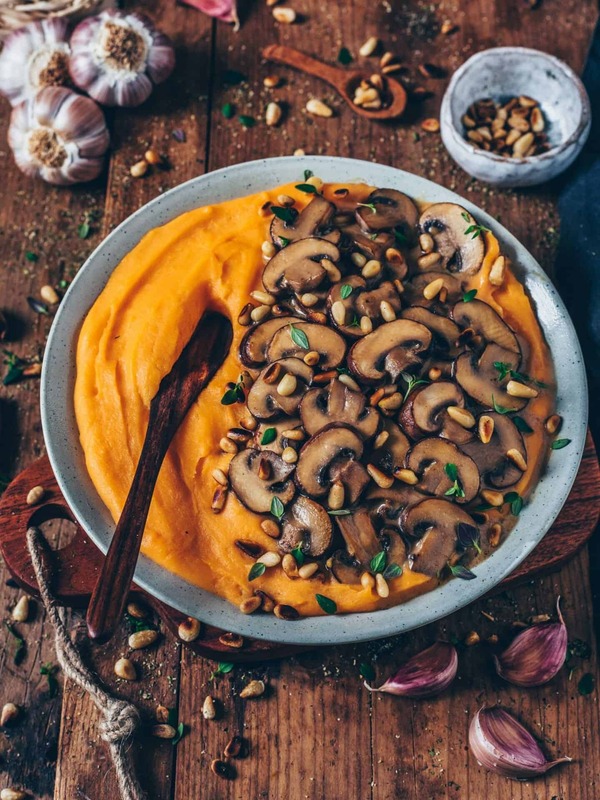 If you’re looking for a quick and nourishing dinner, that fills you up and tastes delicious, look no further! 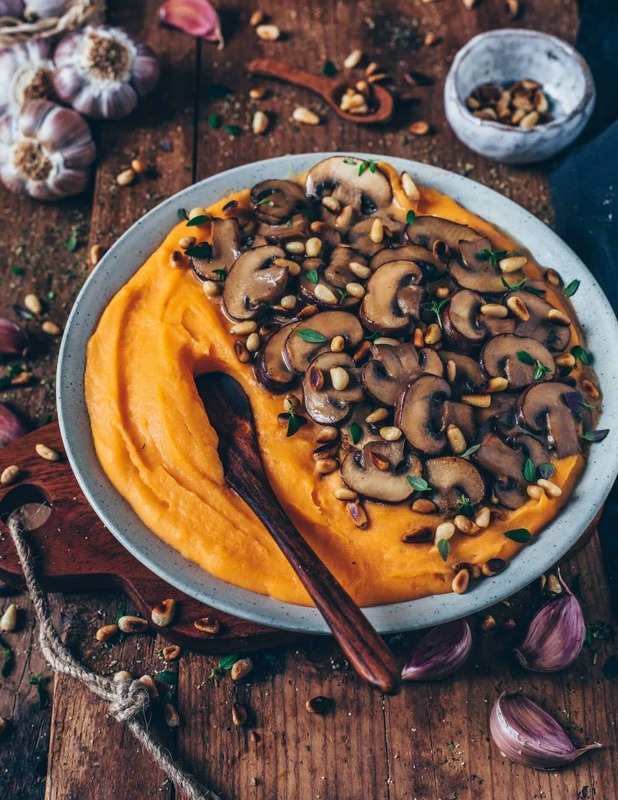 This easy white and sweet mashed potatoes with vegan mushroom gravy contains only plant-based ingredients, and is super flavorful! 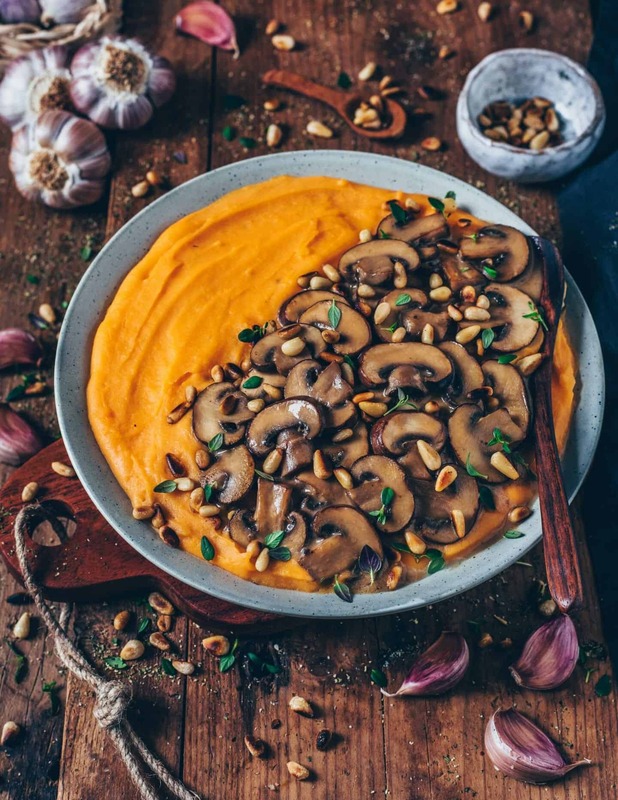 It’s also healthy, gluten-free, grain-free, and a great variation to my creamy polenta with roasted mushrooms and spinach. 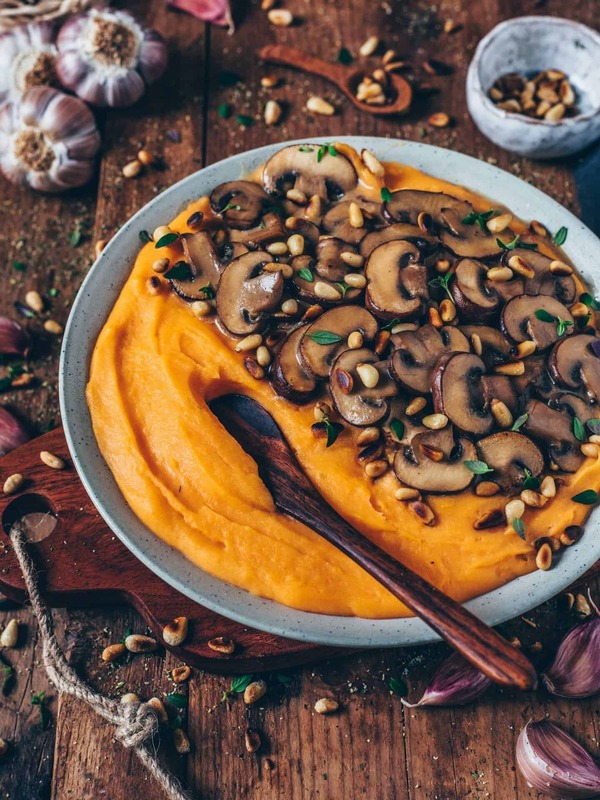 I‘ve always loved fluffy and creamy mashed potatoes and especially when you also add other vegetables, such as sweet potatoes or carrots. 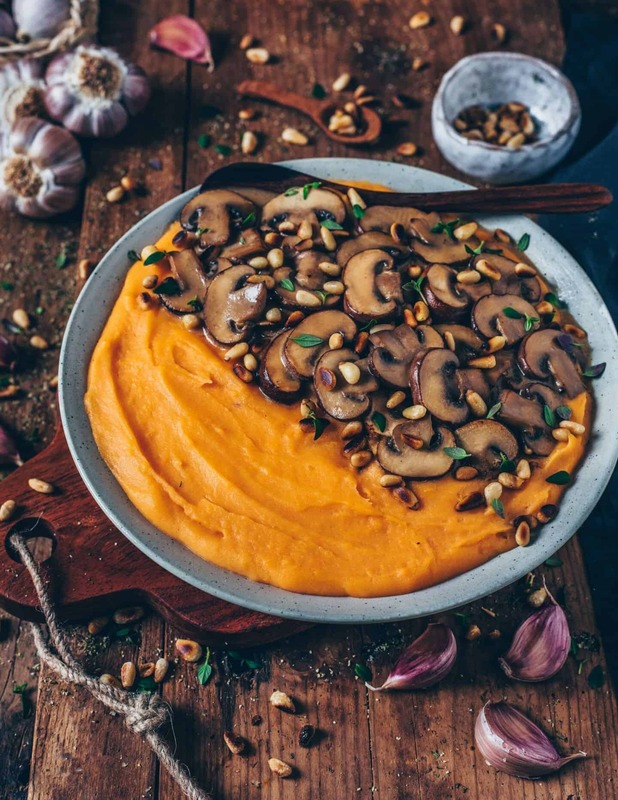 When I was a child, my mom used to make mashed potatoes or mashed sweet potatoes quite often because it’s such a delicious way to eat vegetables and fill your body with vitamins. Of course, you can add any vegetables you like. I‘ve already made it with cauliflower, parsnips, broccoli, and pumpkin. However, I love all variations. Anyways, I think it’s not only a healthy meal for children or babies, but also for adults. 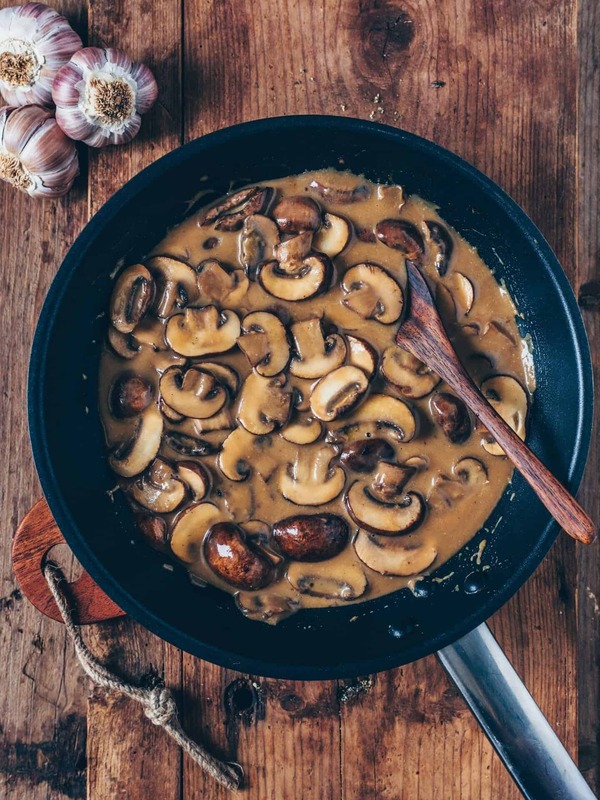 In combination with a savory and flavorful vegan mushroom gravy, it makes the perfect comfort meal or simple side dish. 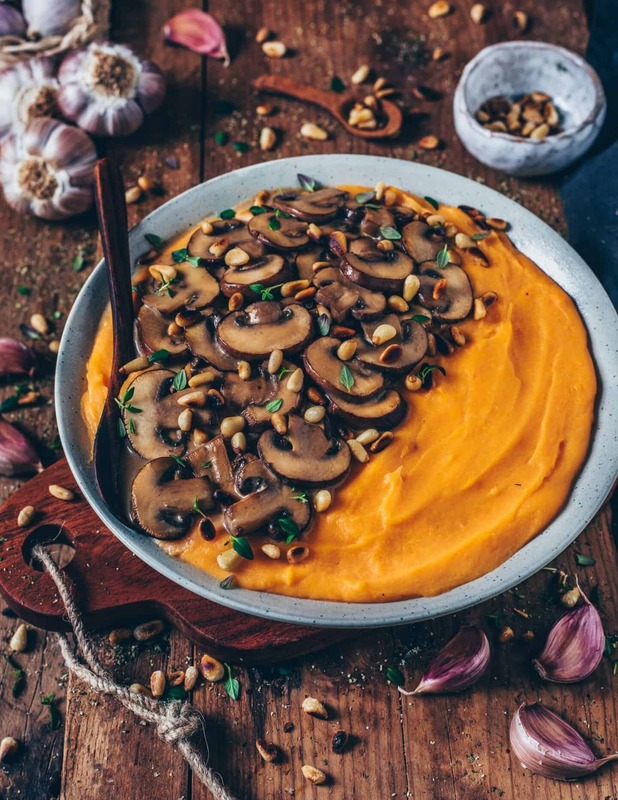 It’s also a perfect dinner for Christmas, Thanksgiving or enjoy it just as a cozy weeknight dinner. 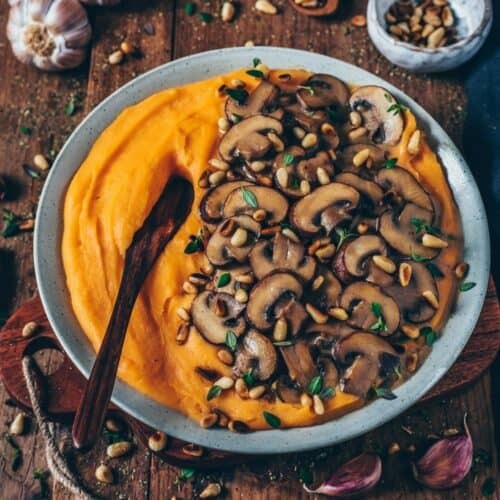 This hearty vegan mushroom gravy tastes so delicious in combination with mashed sweet potatoes! 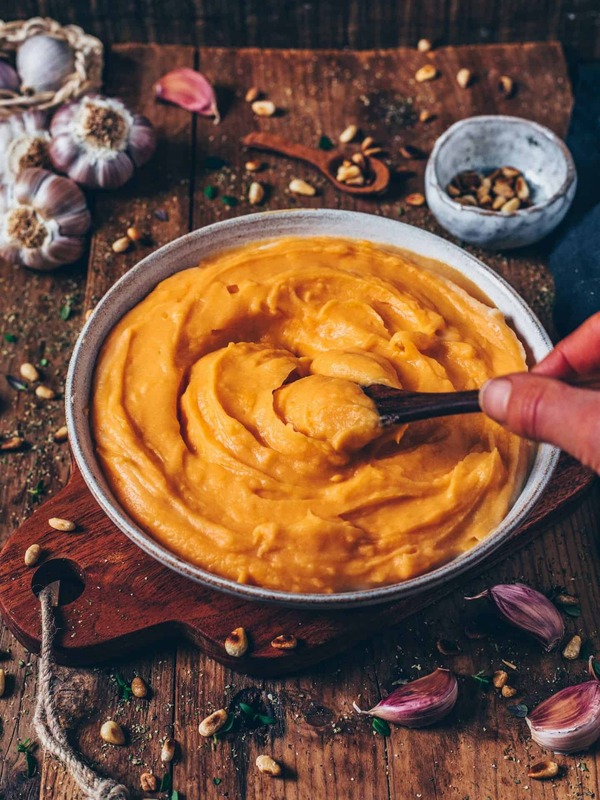 I kept this gravy simple with minimal ingredients, but feel free to amp it up with more spices or herbs of choice. 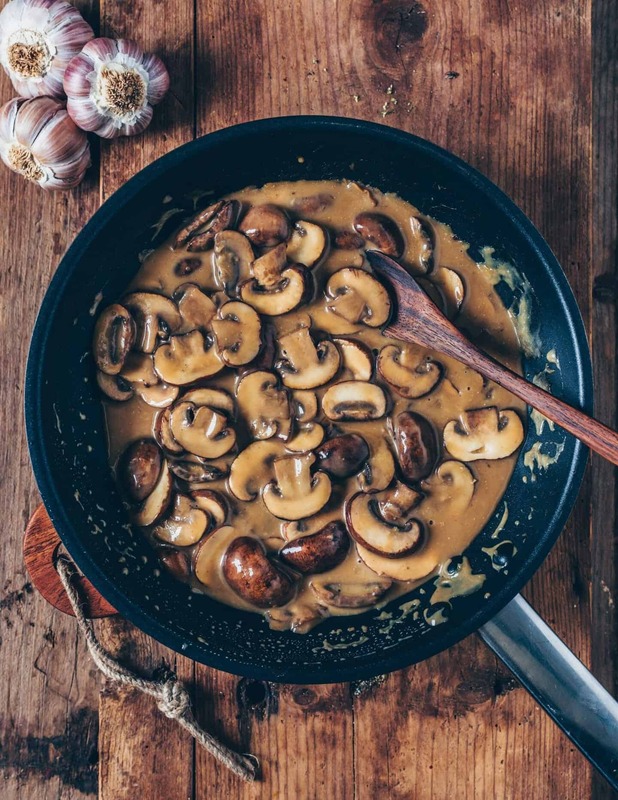 To me, this creamy Sauce reminds also of vegan Mushroom Stroganoff. It’s a rich & savory sauce, made of just sautéed onions, garlic, mushrooms, vegan butter, vegetable broth, organic flour, and seasonings. It’s simple, tasty & smooth and contains no greasy drippings, such as dairy fat. 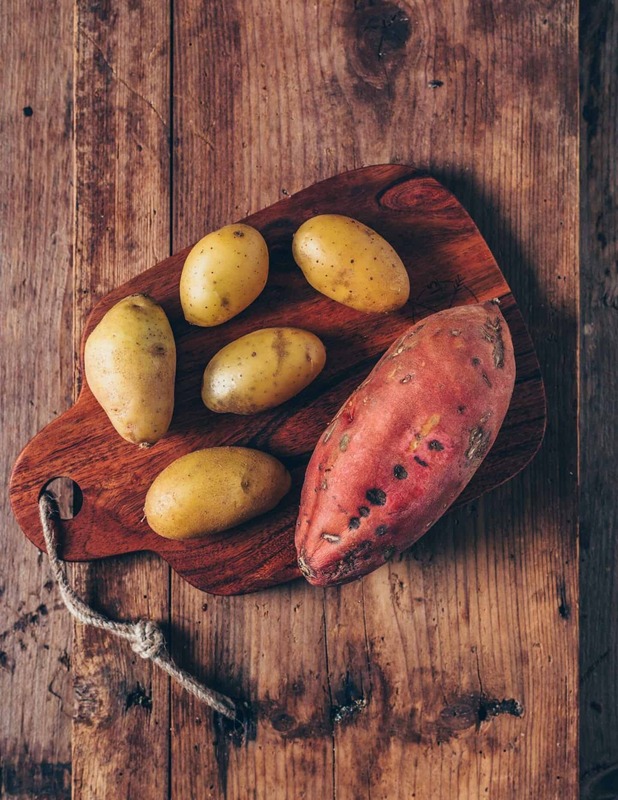 Put the potatoes in a large pot and add just enough water to cover them. Bring to a boil and cook until fork-tender, about 15 minutes. 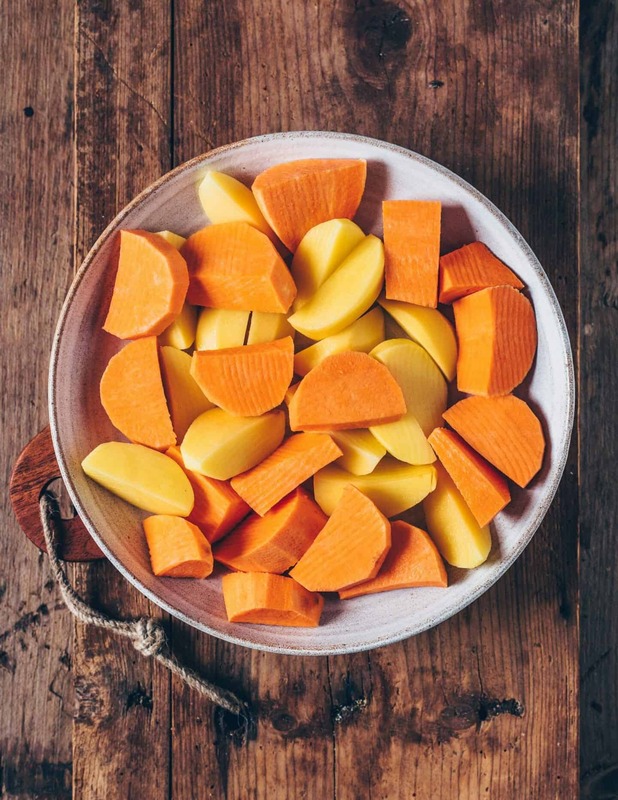 Drain and put potatoes back to the pot on the stove top with the heat turned off. This helps any excess water evaporate. 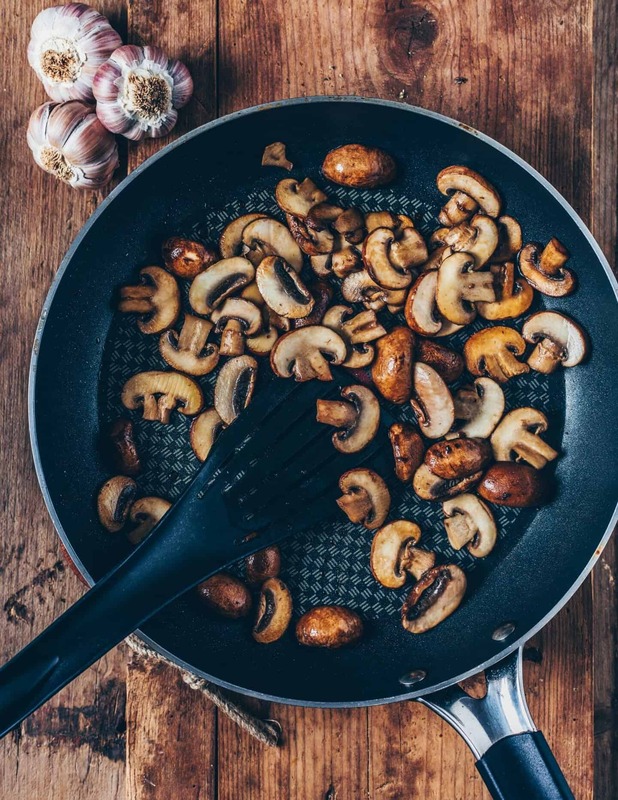 Heat the vegan butter (or oil) in a large pan over medium heat. Sauté the onions until translucent and browned, about 4-5 minutes. Add garlic and sauté for 1 minute longer. 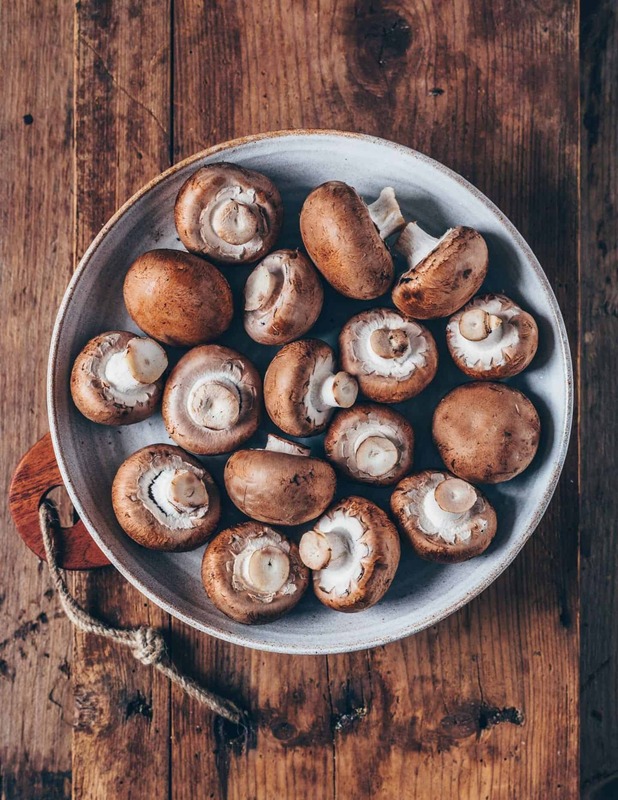 Add mushrooms and fry until lightly browned, about 5 minutes. Season with salt and pepper to taste. 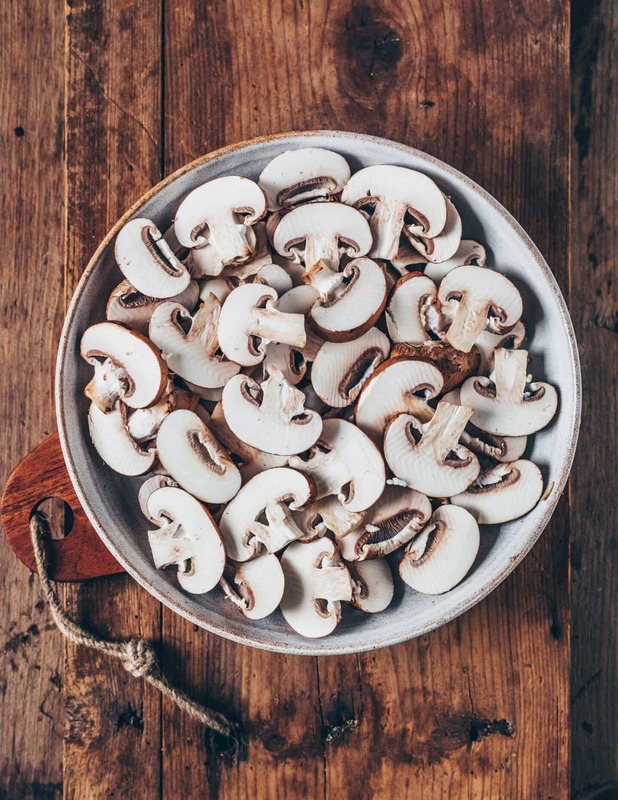 Pour in vegetable broth, soy sauce, and plant-based cream. In a small cup, add cornstarch to a little water and stir to dissolve. Stir in the sauce and bring to a simmer. Cook for 5-7 minutes, until gravy has thickened to desired consistency. Add nutritional yeast flakes (optional) and more salt and pepper if needed. 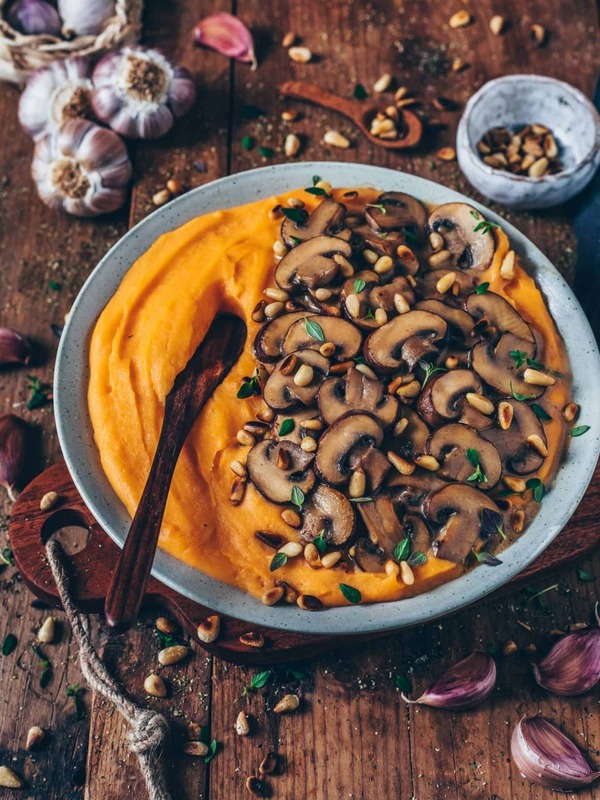 Top your mashed potatoes with mushroom gravy, fresh herbs and toasted pine nuts (optional). Serve immediately. 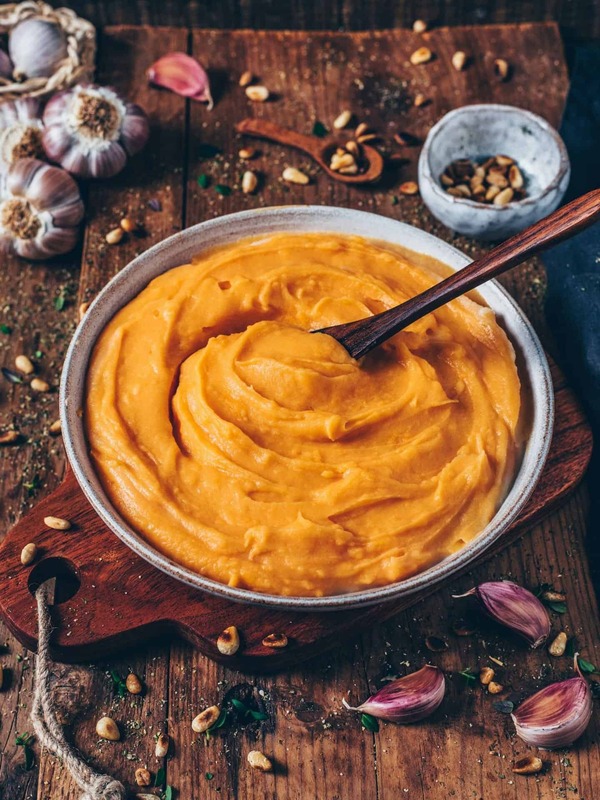 I used regular white potatoes and sweet potatoes for this recipe, but you could also use any other variety of creamy potatoes or vegetables. Thank you so much, my dear Ela! Hey Bianca! 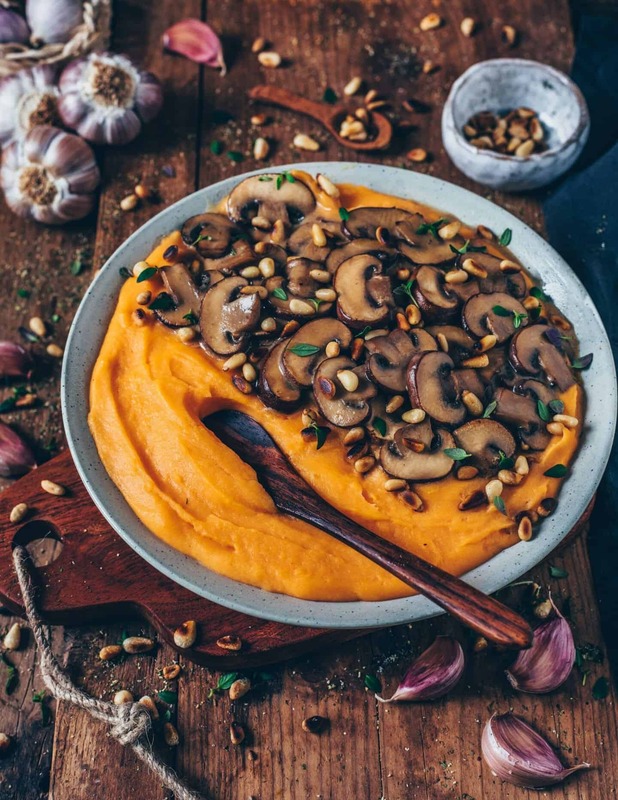 I’m trying to make this and was a bit confused….in the ingredients u dont mention corn starch but in the directions u state it and the directions are a bit confusing do i add corn starch the the other things? I’ve mentioned the cornstarch in step 4. it’s necessary to thicken the sauce.